I was visiting this particular school for some research related work; it was my second visit. Because of our organization’s rapport with the school the teachers there have always been welcoming. During a conversation, one of the teachers expressed her need for some activity based support in science. 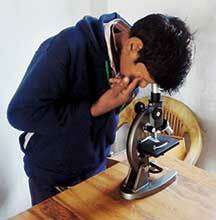 Recently, the school had invested in a microscope. However, so far the microscope had remained in the cupboard as the teacher was not comfortable handling it. She wanted my support in adjusting, setting, and showing some microscopic objects to the students. I promised that the next day I would do some activity on the microscope and its functioning. Before going any further I would like to tell you that this school is situated in the remote hilly areas of Uttarkashi in Uttarakhand. Despite this, the school is one of the luckier ones as it has a working microscope. Most schools don’t have such equipment and if they do, they are either damaged or not in working condition. In these areas, repairing equipment or replacing them takes a long time and effort from the teachers. So, the next day I took one permanent slide from an Eklavya science kit and reached the school. After a fun introduction session, I conducted some activities on plants. I asked the students to go out and bring one grass/wheat plant and one mustard/pea plant with their roots (the school was surrounded by small fields). All the students of that class roamed around the school and plucked out plants for investigation. I asked the students to observe the roots of wheat and grass and talk about their features. They said the roots were fibrous. Then I asked them to see the roots of the mustard/pea plants. They replied that the roots were reddish and tapered towards the end with fine hairs. On observing the leaves, they found that leaves with parallel venation have fibrous roots and plants having leaves with reticulate venation have one main root with secondary roots (dicot root). My aim here was to help the students note patterns in the diverse world of plants. When they made that link, I told them to observe the seeds of all these plants at maturity and suggested that parallel leaves and fibrous roots are the general characteristics of monocot plants and tap roots and reticulate venations are the general features of dicot plants. After this, we moved towards analyzing the flower of the plants. By dissecting the flower of mustard, phyunli (a local plant) and rhododendron we played with the parts of the flower. I first removed the calyx and corolla and asked the students to name the different parts. When not many responses came, I showed them all the parts first and told them about each part of the flower. I then asked them to arrange all these parts in their notebooks and draw a good picture of all the parts of the flower (of rhododendron). The students did that job delightfully. Each student then brought into class a rhododendron to do his/her own dissection and identify the parts and knew their functions. Then, I briefly talked about fertilization, and process of fruits coming from the ovaries and seeds from the ovules. One student immediately observed that rhododendrons don’t have fruits. But another student countered saying he had seen a rhododendron fruit – a small roundish thing. I then told the students that fruits don’t always have to be edible. The function of a fruit is to help the plant reproduce as it contains the seeds. I asked them to draw and label the parts and also keep the relevant extracted part of the flower next to the picture in their notebooks. 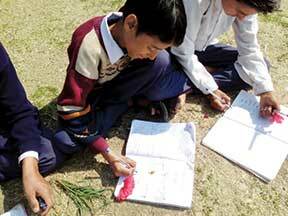 By the end of the activity from the reports they were asked to write, it was clear that they had learnt about flowers and fruits even as they had some fun. Then we moved on to the microscope. The teacher brought in the microscope and excited students immediately surrounded it. I showed the students the different parts of the microscope. The students observed and matched the parts with the image of the microscope in their textbooks. I showed them how to put in a slide and use the microscope. When I put the slide of leaf veins I had brought with me, the excitement among both teachers and students was palpable. Some students started observing images of the parts of the microscope in their textbooks and added value to the discussion and activity. The teacher shared her excitement by inviting students of other classes as well to look through the microscope. All this gave me immense satisfaction. The entire school was very happy to see their boxed microscope functioning. This was an unforgettable experience both for the teachers and the students of this small village school. And all this was made possible by just showing a slide through a microscope. I promised to visit the school again and teach the students how to prepare slides for the microscope. That day I realized that the joy of sharing something with kids, especially unprivileged ones, gives ultimate happiness and satisfaction. The author is working with the science team of the Azim Premji Foundation, Uttarkashi. He is interested in popularizing science and writing on general science and development related issues. He can be reached at mohammadzafar78@gmail.com.